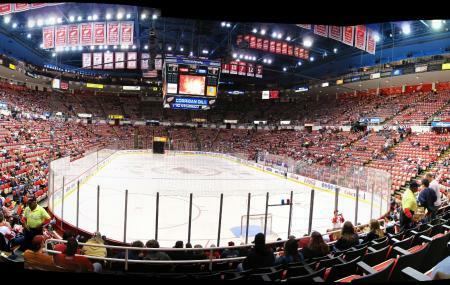 Joe Louis Arena, or The Joe, home to the 11 time Stanley Cup winners Detroit Red Wings of the National Hockey league, is a hockey arena located in downtown Detroit. The Arena is one of 3 hockey arenas without corporate sponsorship in all of the United States. This 20 thousand plus seater is Detroit’s largest indoor venue and hosts a wide range of exciting events including, but not limited to, National Hockey Matches, concerts, college football games and circuses. Between $15 and $330 depending on seats and game. Doors open 90 minutes prior to a game. Love this? Explore the entire list of places to visit in Detroit before you plan your trip. Fancy a good night's sleep after a tiring day? Check out where to stay in Detroit and book an accommodation of your choice. How popular is Joe Louis Arena? People normally club together Windsor Riverfront and Detroit International Riverfront while planning their visit to Joe Louis Arena. Great arena but never really cared about it, I could care less if it gets imploded like the Silverdome. The only reason gave 3 instead of a 5, because l enjoyed and loved all what Little Cesar's Arena has to offer and 99% of employers where smiling, helpful and professional, this will tell you how one employee name Todd ruined not just my husband and my experience but alot of people l seen happen , he worked on floor 6 at WWE Sat. Mar.9,2019 I have so much to say about this man because he treated everyone very rude. My husband and l were 6 rolls from stage we paid a price for this so we could enjoy , have fun and it was a nightmare. I watched a grandmother in front of us bring her handicap daughter and grandson in first roll, she went to give grandson food and was told sit down, the boy was excited , happy to be there and Todd made this boy sit in chair the whole time telling him sit every time he jumped up with excitement he was 5-6 yr. Old boy not in the way of anyone but his grandma behind him. There was a young boy 6-8 yr. Old sitting next to my husband and his mom made him a sign with Randy Orton and his dad held him up so he can watch Randy walk down to ring and get in ring , l should say there were no professional match at time and this man Todd made his father put him down on his seat. These are little boys jumping with excitement and wow could not believe what l seen and it was not like these boys were standing during the fight people had respect for others to be able to see, l myself we're taking a picture and he came over to tell me no video taping and l said l am not taking videos want to see...there was a older man second roll taking pictures and he went over to him and he was upset, let me say l seen more happen. Todd made our experience the worse for first time at a WWE event, l will not recommend anyone to pay that price to be treated that way! I do feel bad giving a review like this when other employees in other sections were great with there sections or all other employees were great .. Todd if you don't like your job don't be there and ruin events for people! When the Joe meets the wrecking ball sometime this year, the People Mover station would probably close until much further notice. Sadly I never got the chance to see this one of a kind historic venue or experience a Red Wings game here, let alone a historic post season game. So sad to see it go, it's the Cincinnati Red's Riverfront stadium all over again, at least I saw a game or two there before it was gone. Also the Wings will not win a postseason game in the new Arena, because sometimes this happens when a team moves into a new venue after having tons of success in the old one.